Carefully crafted as a gift for that special someone who always chooses savoury over sweet, the Savoury Feast gift box draws together favourite light snack and healthy lunch options. 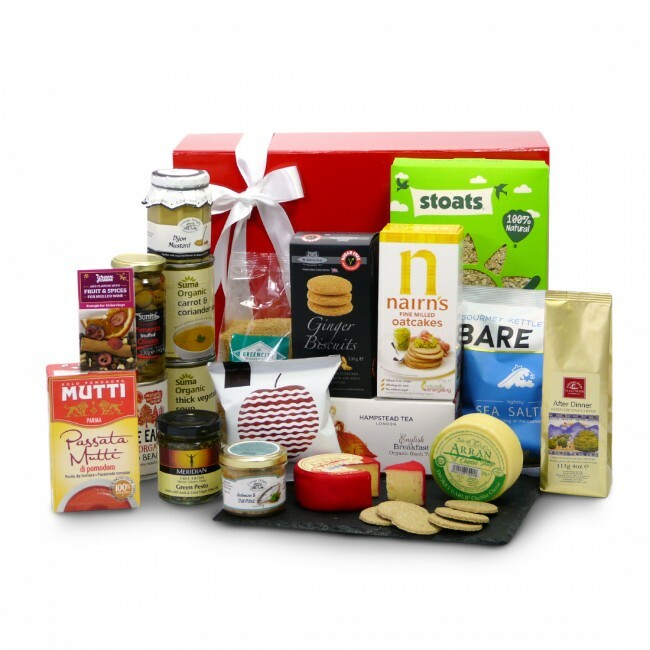 Enjoy fine milled oatcakes with a choice of flavoured cheddar cheeses, smooth salmon and dill pate, stuffed olives and gourmet popcorn, and for natural sweetness apple crisps and no added sugar ginger biscuits. For hearty meals, try the organic couscous , free from green pesto, natural Italian passata, porridge oats, whole earth baked beans and a selection of delicious soups. The food and drink in the Savoury Feast Gift Box is carefully packed by hand in a gorgeous gift box.